Our world is always more complex and now we are all facing massive changes in our computing environments. Changes are brought by the adoption of technologies like Internet of Objects (IoT) and Internet of Everything (IoE), cloud computing and mobile technology. Megatris Comp. has developed an enterprise integration platform to embrace such technological evolution: Smart System Bus (SSB), a cloud based hyper-connected internet objects. Smart Objects (SO) are embedded computing devices spread out in networks. An SO combines the abilities to compute, communicate, act and sense. Possible applications are medical monitoring of different health parameters (intra and extracorporeal), environment monitoring, control of industrial machines and devices. An SO connected to web realizes the Internet of Objects that are Objects of the physical world connected through Web protocols. Mobiles are a conspicuous example of SO interconnected using web services and push server. We believe that consumer devices, enabled with our context aware software, will engage sensors 100 percent of the time: monitoring and learning about the consumer so that the SSB can actively “proactively” rather than passively interact, with its users. 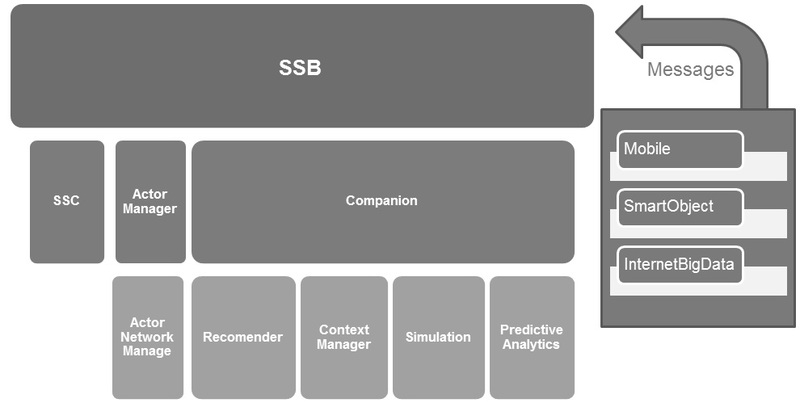 SSB has layered framework that interpret message arriving from SOs, update user’s context, run analytics or simulations and generate forecast, recommendations or commands if operations are necessary. SSB has a software architecture model for distributed computing and it remotes strictly asynchronous message for communication and interaction between applications. Its primary use is in Application Integration of heterogeneous and complex landscapes. It is a Message-oriented Middleware (MoM) that uses event-driven and standards-based M2M in combination with message queues is technology frameworks. As a software architecture model for distributed computing it is a specialty variant of the more general client server software architecture model and promotes strictly asynchronous message oriented design for communication and interaction between applications. Its primary use is in Application Integration of heterogeneous and complex landscapes. Web services (microservices) are a central point to perform orchestration, mediation and routing allowing the development team to concentrate on delivering functionalities and value. A Digital Angel is integrated in the Actor Manger and uses rules, semantic networks and neural networks forrecognition,learning , recomandations, command and control of Smart Objects.